how to add another code in robot.txt ? Squirrly SEO does not have a robots.txt editor because is for non-SEO users. If you need to edit it, you can use additional wordpress plugins for this feature. I also need another set of robot files, is trashing my scans with other links. How can I disable this? Is really hurting cause search engines are entering wrong parts. You should be able to disable the robots from Squirrly > SEO Settings. We will bring the editable robots in the next upgrade too. How are you coming along with this Calin? This would be a nice feature. I tried to find it in the Squirrly > SEO Settings, but is not there. I want thought maybe turning of the xml might work, but it still over-road the htaccess file I would like it to read. This feature will be released in the last version of Squirrly 2018. You can connect to https://my.squirrly.co and subscribe to get the early version of the plugin. Hi! 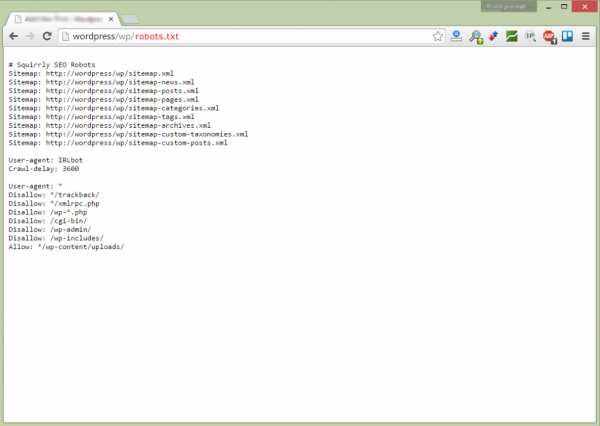 How to disable robots.txt in your plugin? Hi, You can switch it of from Squirrly > SEO Settings > Global Settings.